Global financial markets have been highly volatile over the past week, starting with U.S. equities following last Friday’s strong job numbers. The data showed manufacturers adding 15,000 workers on net in January, with 15,750 employees per month on average in 2017. The tight labor market conditions were further illustrated by solid wage growth, including 2.8 percent gains in the manufacturing sector over the past 12 months. In addition, as expected, the Federal Open Market Committee (FOMC) chose not to increase short-term rates at its January meeting, but it did suggest that “measures of inflation compensation have increased in recent months but remain low.” The FOMC is expected to hike the federal funds rate at its March 20–21 meeting. Strong economic growth, including job gains and wage pressures, combined to send a signal to financial markets that the Federal Reserve might be more hawkish on rates than some might have predicted, and that was enough to send equity markets sharply lower. 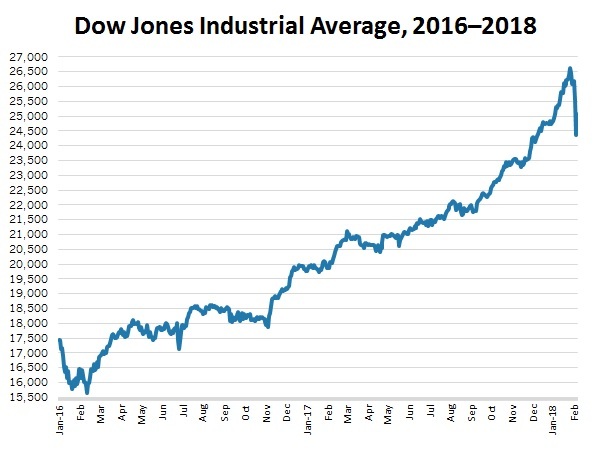 For instance, the Dow Jones Industrial Average is down 4.8 percent so far in February (as of yesterday’s close), although, to be fair, it remains 36.3 percent higher than it was on Election Day in 2016. One could easily make the case that a correction was overdue. Fortunately, the financial market has—at least for now—shown signs of stabilizing after the freefall earlier in the week, but analysts suggest that we might be in for more volatility. Despite the stock market fluctuations of the past week, the fundamentals of the worldwide economy remain quite healthy, and more importantly, the outlook continues to be strong. The J.P. Morgan Global Manufacturing PMI pulled back slightly from December’s pace, which was the fastest since February 2011, but the good news is that exports strengthened in the latest figures to the best reading in nearly seven years—a sign that trade volumes have picked up as the international economy has continued to improve. Output and employment remained at the best rates since early 2011, with new orders slipping a little from a seven-year high but continuing to expand at a decent clip. Looking ahead six months, manufacturing leaders remained very upbeat in their global outlook, with that measure at an 11-month high. In January, all of the top-15 markets for U.S.-manufactured goods expanded. (There is no manufacturing PMI for comparison purposes for Belgium, which is our 10th-largest trading partner.) South Korea, which contracted ever so slightly in December, returned to positive growth again in January. As has been the case for several months, Europe once again dominated the list of top export markets with strong manufacturing growth, but other regions were also well represented. Those countries with the highest PMI readings in the sector in January included the Netherlands (a new all-time high), Germany, France, Taiwan, the United Arab Emirates, Canada, the United Kingdom and Japan. U.S.-manufactured goods exports rebounded strongly in 2017—a nice turnaround after global economic weaknesses in both 2015 and 2016.Using non-seasonally adjusted data, U.S.-manufactured goods exports totaled $1,094.73 billion in 2017, up 4.34 percent from $1,049.24 billion in 2016. This reflects better year-to-date figures to the top-six markets for U.S.-manufactured goods. The U.S. dollar has fallen 2.6 percent so far in 2018 against major currencies, according to the Federal Reserve, or 11.0 percent since the end of 2016, helping to improve international demand for U.S.-manufactured goods. Yet, despite the positive news for manufacturers, the U.S. trade deficit rose in December to the highest level since October 2008. Beyond that headline, however, goods exports, petroleum exports, service-sector exports and goods imports rose to all-time highs, highlighting the increase in global trade of late. As the NAM explained in public comments submitted to the Trump administration in May 2017, there are many factors that impact and cause changes in the U.S. trade deficit over time, including overall domestic conditions and standards of living, domestic consumption and purchasing compared with savings rates and the price of goods in the market, which is, in turn, impacted by exchange rates, domestic structural issues (e.g., taxation, regulation) and openness to international trade. Furthermore, when the U.S. economy has grown, the trade deficit has typically expanded as U.S. economic activity and consumption grow, while the trade deficit has shrunk when the U.S. economy has showed slower growth. Talks to modernize and update the North American Free Trade Agreement (NAFTA) and address issues in the U.S.–Korea Free Trade Agreement (KORUS FTA) continued in January, as the Trump administration started to make trade enforcement decisions. The NAM continues to push forward on a fully functioning Export-Import (Ex-Im) Bank and to improve the operation of global institutions. The NAM also joined a new trade initiative—Trade for America. Global manufacturing began the new year with solid growth, even with a slight pullback in the headline index from December, which was the fastest pace since February 2011. The J.P. Morgan Global Manufacturing PMI edged down from 54.5 in December to 54.4 in January. The good news is that exports strengthened in the latest figures to the best reading in nearly seven years (up from 53.9 to 54.1)—a sign that trade volumes have picked up as the international economy has continued to improve. Output (unchanged at 55.6) and employment (unchanged at 53.0) remained at the best rates since early 2011, with new orders slipping a little from a seven-year high (down from 55.9 to 55.4) but continuing to expand at a decent clip. Looking ahead six months, manufacturing leaders remained very upbeat in their global outlook (up from 63.6 to 64.4), an 11-month high. Readings greater than 60 suggest robust growth in overall production for the next six months. In January, all of the top-15 markets for U.S.-manufactured goods expanded. (There is no manufacturing PMI for comparison purposes for Belgium, which is our 10th-largest trading partner.) South Korea , which contracted ever so slightly in December, returned to positive growth again in January (up from 49.9 to 50.7). Moreover, the Korean outlook for 2018 also looks promising. The index for future output in South Korea reached the highest level since April 2015 (up from 58.0 to 61.0). As has been the case for several months, Europe once again dominated the list of top export markets with strong manufacturing growth, but other regions were also well represented. Those countries with the highest PMI readings in the sector in January included the Netherlands (up from 62.2 to 62.5—a new all-time high), Germany (down from 63.3 to 61.1), France (down from 58.8 to 58.4), Taiwan (up from 56.6 to 56.9), the United Arab Emirates (down from 57.7 to 56.8), Canada (up from 54.7 to 55.9), the United Kingdom (down from 56.2 to 55.3) and Japan (up from 54.0 to 54.8). The U.S. dollar has fallen 2.6 percent so far in 2018, or 11.0 percent since the end of 2016, helping to improve international demand for U.S.-manufactured goods. The trade-weighted U.S. dollar index against major currencies from the Federal Reserve Board has fallen from 95.7228 at the end of 2016, to 87.4741 at the end of 2017, to 85.1997 on February 2. This index reflects currency units per U.S. dollar, suggesting that the dollar can now purchase less than it could before and vice versa. With that said, the index registered 75.7513 on June 30, 2014, illustrating the dollar’s continued strength, up 12.5 percent over that time frame. For manufacturers, growth in the dollar’s value over the past three years presents a real challenge as firms seek to increase international demand. Nonetheless, that drag has lessened since the end of 2016, with the “cheaper” dollar helping manufacturers in the United States better compete in export markets. U.S.-manufactured goods exports rebounded strongly in 2017—a nice turnaround after global economic weaknesses in both 2015 and 2016. Using non-seasonally adjusted data, U.S.-manufactured goods exports totaled $1,094.73 billion in 2017, up 4.34 percent from $1,049.24 billion in 2016. This reflects better year-to-date figures to the top-six markets for U.S.-manufactured goods: Canada (up from $266.80 billion to $282.39 billion), Mexico (up from $229.70 billion to $242.99 billion), China (up from $115.60 billion to $130.37 billion), Japan (up from $63.24 billion to $67.70 billion), the United Kingdom (up from $55.29 billion to $56.33 billion) and Germany (up from $49.36 billion to $53.49 billion). Manufacturing activity in the Eurozone pulled back slightly in January from December’s all-time high. The IHS Markit Eurozone Manufacturing PMI declined from 60.6 in December—its best reading since the survey began in June 1997—to 59.6 in January. Most of the underlying indices edged down in January but remained strong overall. This included slightly decelerated expansions for new orders (down from 61.5 to 59.6), output (down from 62.2 to 61.1), exports (down from 60.6 to 58.4) and employment (down from 58.2 to 57.9). Despite those figures, manufacturers in Europe remained very optimistic in their outlook. Along those lines, expectations for future output rose in January to the fastest rate since the question was added to the survey in July 2012 (up from 67.6 to 68.2). As noted earlier, many of the best PMI readings globally occurred in Europe, showing how much the continent’s economies have turned a corner over the past year. Indeed, activity jumped to a new all-time high in the Netherlands (up from 62.2 to 62.5), with multiyear highs in both Greece (up from 53.1 to 55.2, best since October 2007) and Italy (up from 57.4 to 59.0, best since February 2011). With that said, many of the other key markets saw a pullback in January activity, albeit at still healthy rates of growth. This included easing expansions in Austria (down from 64.3 to 61.3), France (down from 58.8 to 58.4), Germany (down from 63.3 to 61.1), Ireland (down from 59.1 to 57.6), Spain (down from 55.8 to 55.2) and the United Kingdom (down from 56.2 to 55.3). Real GDP in the Eurozone rose 0.6 percent in the fourth quarter, with 2.7 percent growth year-over-year. This was off just slightly from 2.8 percent growth year-over-year in the third quarter, which was the fastest pace since the first quarter of 2011. There will be new industrial production data for December out on February 14. It is hoped it builds off of the strong gains in November, with industrial production up 1.0 percent, led by healthy gains in output for capital goods, durable consumer goods and intermediate goods. On a year-over-year basis, industrial production has risen 3.2 percent. The unemployment rate remained at 8.7 percent in December, its lowest level since January 2009. Unfortunately, retail sales fell 1.1 percent in December, pulled lower by reduced spending on automobiles, apparel and food. Nonetheless, even with December’s decline, retail sales have risen 1.9 percent since December 2016, a modest pace. Canadian manufacturing activity expanded in January at the fastest pace since April. The IHS Markit Canada Manufacturing PMI increased from 54.7 in December to 55.9 in January, continuing a trend of improvements in the Canadian economy that began last year as the energy market stabilized. In January, the underlying data points increased across the board, including new orders (up from 54.6 to 56.4), output (up from 54.1 to 56.2), exports (up from 50.6 to 53.3) and employment (up from 54.8 to 55.9). Sales, exports and production each grew at the best rates since the summer. In addition, manufacturers in Canada feel very optimistic about production growth over the next six months, with the future output index edging higher (up from 64.3 to 66.7). The regional data increased for the most part, with improvements in Alberta and British Columbia (up from 57.7 to 59.9), Ontario (up from 54.9 to 56.6) and the rest of Canada (up from 51.1 to 52.2) but with a slower expansion in Quebec (down from 52.3 to 51.8). Real GDP growth eased from 1.0 percent in the second quarter to 0.4 percent in the third quarter, largely on weaker export data. That translated into 1.7 percent growth at the annual rate, down from 4.3 percent in the second quarter. Moreover, manufacturing sales decreased 0.4 percent in October, mostly on reduced chemical, machinery and motor vehicles and parts orders. Still, manufactured goods sales have risen 4.3 percent year-over-year. In addition, retail spending jumped 1.5 percent in October, with Canadians spending a whopping 6.7 percent more over the past 12 months. Meanwhile, the unemployment rate fell to 5.7 percent in December, its lowest rate since comparable data became available in January 1976. Yet, manufacturers lost 3,600 workers on net for the month. In 2017, however, the sector added 85,700 employees. Mexican manufacturing activity expanded for the third straight month, expanding modestly but still below par. The IHS Markit Mexico Manufacturing PMI increased from 51.7 in December to 52.6 in January, the best reading since September. New orders (up from 53.0 to 53.8), output (up from 50.9 to 52.3), exports (up from 51.7 to 52.0) and hiring (up from 51.3 to 52.6) each accelerated in January, and future output remained highly elevated despite easing marginally in the latest survey (down from 64.2 to 64.1). With that said, the index for future output registered 71.8 just two months ago. Overall, Mexico continued to underperform. Along those lines, real GDP decelerated from 1.9 percent year-over-year in the second quarter to 1.5 percent in the third quarter, the slowest growth rate since the fourth quarter of 2013. Industrial production declined 1.5 percent year-over-year in November, falling for the sixth consecutive month. Manufacturing has fared better, up 2.4 percent over the past 12 months, but it has decelerated since notching a 5.0 percent year-over-year pace in May. Meanwhile, the unemployment rate decreased to 3.1 percent in December, the lowest rate since December 2007. Chinese manufacturing activity expanded for the eighth consecutive month. The Caixin China General Manufacturing PMI was unchanged at 51.5 in January, but the underlying data provided mixed results. On the positive side, output expanded at the best pace since December 2016 (up from 52.1 to 52.8), with future output also signaling modest growth in the coming months (up from 53.8 to 56.4). On the other hand, new orders (down from 53.0 to 52.3) and exports (down from 52.6 to 52.4) eased a little in the latest report. Net hiring has contracted every month since October 2013 but stabilized somewhat in January (up from 49.1 to 49.4). Separately, the official manufacturing PMI from the National Bureau of Statistics of China fell for the second straight month, down from 51.6 in December to 51.3 in January. Large firms reported expanding activity levels, whereas small manufacturers cited lingering weaknesses. The Chinese economy grew 6.8 percent year-over-year in the fourth quarter, the same rate as in the third quarter. For the year, Chinese real GDP rose 6.9 percent, which was better than expected. Industrial production ticked higher in the latest data, up from 6.1 percent year-over-year to 6.2 percent. At the same time, fixed asset investment, which was unchanged at 7.2 percent year-over-year, has decelerated since its recent peak of 9.2 percent year-over-year in March. Meanwhile, retail sales weakened noticeably in the latest data, down from 10.2 percent year-over-year in November to 9.4 percent in December. Retail spending registered 11.0 percent year-over-year as recently as June. Manufacturing activity in the emerging markets pulled back in January from December’s pace, which had been the best rate since January 2013. The IHS Markit Emerging Markets Manufacturing Index decreased from 52.2 in December to 51.8 in January. Despite some slippage, the data mostly continue to show improvements in emerging market economies, which is encouraging. Nonetheless, the underlying data in January provided mixed results. Output (up from 53.3 to 53.5) and exports (up from 52.1 to 52.2) both ticked higher in the latest survey, but new orders (down from 53.6 to 52.7) and hiring (down from 50.3 to 50.2) eased somewhat in their expansions. More importantly, employment grew for the second straight month—definite progress after contracting in every month since February 2015 prior to December. In addition, future output continued to reflect general optimism about the next six months, with that measure at its highest level since May (up from 60.5 to 61.9). On a country-by-country basis, a number of emerging markets set milestones in January, including the Czech Republic (unchanged at 59.8) and Taiwan (up from 56.6 to 56.9), both of which observed manufacturing activity that rose to the highest levels since early 2011. Nigeria (up from 56.8 to 57.3) had its strongest growth since December 2014, with improved performance also seen in Myanmar (up from 51.1 to 51.7), Russia (up from 52.0 to 52.1) and Vietnam (up from 52.5 to 53.4). At the same time, several markets continued to expand at decent rates, despite some of them decelerating in January, including China (unchanged at 51.5), Hong Kong (down from 51.5 to 51.1), India (down from 54.7 to 52.4), Kenya (down from 53.0 to 52.9), the Philippines (down from 54.2 to 51.7), Poland (down from 55.0 to 54.6), Saudi Arabia (down from 57.3 to 53.0) and the United Arab Emirates (down from 57.7 to 56.8). Encouragingly, Malaysia (up from 49.9 to 50.5) and South Korea (up from 49.9 to 50.7) both returned to positive growth to start the new year. In addition, Egypt improved in January (up from 48.3 to 49.9), moving to near neutral territory on stronger export demand and stabilized energy prices. Nonetheless, it remained in contraction. Other emerging markets that contracted in January included Lebanon (up from 46.1 to 47.1) and South Africa (up from 48.4 to 49.0), but both of those economies made some progress in the latest data. The U.S. trade deficit rose in December to a nine-year high. The U.S. trade deficit rose from $50.44 billion in November to $53.12 billion in December, the highest level since October 2008. It is important to note that overall trade volumes have risen significantly over the past few months, with higher goods exports (up from $134.07 billion to $137.47 billion) and imports (up from $204.85 billion to $210.82 billion). In a similar way, service-sector exports also rose to the highest level on record (up from $65.74 billion to $65.88 billion), even as the service-sector trade surplus edged down from $20.35 billion to $20.23 billion. As noted above, the underlying goods exports data mostly rose, led by increased exports for industrial supplies and materials (up $1.55 billion), non-automotive capital goods (up $1.16 billion), other goods (up $517 million) and foods, feeds and beverages (up $448 million). This was partially offset by declines in consumer goods (down $208 million) and automotive vehicles, parts and engines (down $75 million). At the same time, the major categories for goods imports increased across the board, with the largest gains for consumer goods (up $3.21 billion), automotive vehicles, parts and engines (up $1.06 billion), non-automotive capital goods (up $837 million) and industrial supplies and materials (up $567 million). Interestingly, the trade deficit stemmed largely from nonpetroleum sources. The petroleum trade deficit dropped from $4.55 billion in November to $3.28 billion in December. In addition, real petroleum exports reached an all-time high in December at $11.06 billion. NAFTA negotiators hold sixth round of talks in Canada in January, with the next round starting in Mexico City in February. The United States, Canada and Mexico held the sixth round of NAFTA negotiations in Montreal, Canada, from January 21 to 29, during which the three sides discussed a wide range of issues, reaching an agreement on new anticorruption rules. They made little progress, however, on any of the controversial U.S. proposals, although Canada made some new proposals regarding automotive rules of origin and investor-state dispute settlement (ISDS). In a closing statement, U.S. Trade Representative Robert Lighthizer said that “some real headway was made” during the round while underscoring that “we are progressing very slowly.” Ambassador Lighthizer added at a joint press conference with Canadian Foreign Affairs Minister Chrystia Freeland and Mexican Economy Secretary Ildefonso Guajardo Villarreal that “I don't think the president’s view has changed at all. His view is if we can get a good agreement, we should have one,” adding that the existing deal is “really not a good agreement for the United States.” The seventh round of talks will be held in Mexico City from February 26 to March 6. President Donald Trump met with a group of Senate Finance Committee Republicans on February 7, during which they discussed NAFTA and other trade concerns. Consistent with the NAM’s NAFTA paper and its detailed recommendations for modernization, the NAM continues to communicate directly with senior officials throughout the administration and on Capitol Hill regarding the NAM’s priorities and issues of concern. For more information, contact NAM Vice President of International Economic Affairs Linda Dempsey and NAM Director of International Trade Policy Ken Monahan. U.S. and Korean negotiators hold second round of talks on the KORUS FTA. The United States and South Korea met from January 31 to February 1 for the second round of formal talks that aim to improve implementation and potentially amend the KORUS FTA. According to a statement issued by the Office of the U.S. Trade Representative, “The United States emphasized steps to rebalance the Agreement to improve the large trade deficit in industrial goods, including autos and auto parts. Additionally, the United States pressed for the resolution of Agreement implementation concerns that have hindered U.S. goods and services export growth and opportunities in Korea.” Following the negotiations, South Korean Minister for Trade Kim Hyun-chong said “there were very heated negotiations between the two sides” and that “we were forceful in addressing the unfairness” of the U.S. decision to impose tariffs on U.S. imports of washing machines. According to press reports, Korea is also seeking changes to ISDS provisions under KORUS FTA. The next meeting is expected to take place soon, though a date has not been announced. The talks started following a request from the United States in July, and the two governments held two special sessions of the KORUS FTA Joint Committee (August 22 and October 4) prior to the first round of formal talks held in early January. The KORUS FTA has been important to improve the competitiveness of many manufacturers throughout the United States by eliminating barriers, raising standards and ensuring strong enforcement. The NAM, in close coordination with our members, continues to work to ensure full implementation of all parts of the agreement and to promote even greater manufacturing opportunities through the U.S.–Korea commercial relationship. For more information, contact NAM Vice President of International Economic Affairs Linda Dempsey and NAM Director of International Trade Policy Ken Monahan. Manufacturers urge action on MTB as early as possible this year. Manufacturers continue to press for fully functioning Ex-Im Bank. Following its January letter, the NAM continues to urge the Senate to move quickly to get the Ex-Im Bank back to operating at full strength. The administration has not yet re-nominated or selected a replacement for former Congressman Scott Garrett (R-NJ), whose nomination for Ex-Im Bank chairman and president was defeated in December. The Senate could act, but has not yet done so, on nominations of the four board members approved by the Senate Banking Committee in December, although action is being opposed by Sen. Pat Toomey (R-PA) and others. The NAM also continues to support congressional efforts to include a fix to the quorum issues as part of its 2018 appropriations process. For additional information, contact NAM Vice President of International Economic Affairs Linda Dempsey. NAM-led coalition presses U.S. government, international organizations on activities that harm U.S. competitiveness and jobs. The NAM and its Engaging America’s Global Leadership (EAGL) coalition were a strong voice calling for robust U.S. engagement to push international organizations away from divisive initiatives and programs that harm manufacturers in the United States. January 22–27 meetings of the World Health Organization (WHO) Executive Board included initiatives that could damage intellectual property protection and foster problematic tax policies and marketing restrictions. In response, the NAM and other EAGL members urged strong U.S. government leadership and WHO reform to “return [the organization] to its core mission and change its approach” to collaborate with private-sector stakeholders and embrace good regulatory practices and evidence-based approaches. Specific NAM-led efforts included a January 18 association letter to the U.S. government, a February 1 op-ed from NAM Vice President of International Economic Affairs Linda Dempsey and an active social media campaign. The NAM is also ramping up activities related to another international organization, the International Agency for Research on Cancer (IARC), whose programs are promoting consumer confusion and bad regulatory policies that impact manufacturers. This includes statements from Dempsey about how “systematic [IARC] efforts to conceal information and intimidate those with concerns directly contradict the values of…member states that support their work” and an association letter to the House Science, Space and Technology Committee calling for action in advance of a February 6 hearing. For more information about EAGL and the NAM’s work on global institutions, contact NAM Director of International Business Policy Ryan Ong. Administration starts to act on trade enforcement matters. In January, the Trump administration took action on two Section 201 safeguard cases, choosing to impose tariffs on imports of solar cells and modules and of finished washing machines that the U.S. International Trade Commission had found had increased in such quantities to be a substantial cause of significant harm to the domestic solar cell and washing machine industries. South Korea and China filed challenges at the World Trade Organization (WTO) to both cases, Taiwan joined the case against solar cells, and other WTO challenges are expected. Separately, the Commerce Department delivered to the White House final reports in its Section 232 investigations into the national security implications of imports of steel and aluminum in late January. Based on the Trade Expansion Act of 1962 on which these actions are being conducted, the president has up to 90 days after receiving each report to take action, setting April 11 and April 19 as the respective deadlines for action in the steel and aluminum cases. A third Section 232 investigation may also be initiated after the filing of a case alleging imports of uranium are posing a threat to U.S. national security. The administration’s Section 301 investigation into Chinese intellectual property and technology transfer issues is ongoing. While the final deadline for that case is August 2018, there is some expectation that it will be completed earlier. In addition, the administration still has several reports finalized but not yet made public in 2017 on the trade deficit, trade agreement implementation and violations and reciprocal government procurement agreements. If any of these reports are issued publicly, they may set the stage for further administration trade enforcement or negotiation activity. For additional information, contact NAM Vice President of International Economic Affairs Linda Dempsey. NAM joins new Trade for America initiative. Last month, the NAM joined with the American Farm Bureau Federation, Business Roundtable and U.S. Chamber of Commerce to coordinate and advance trade modernization efforts. The first part of this effort was the launch of the Trade for America efforts at an event in Dallas, Texas, on January 24. As NAM President and CEO Jay Timmons explained in the launch press release, “The future of modern manufacturing and the livelihoods of millions of Americans depend on our ability to sell our products to customers overseas—and to have strong trading partnerships with existing trade agreement partners and many other countries. The jobs of more than 2 million men and women are supported by the export of U.S.-manufactured goods to Canada and Mexico, while the U.S.–Korea economic partnership supports the jobs of hundreds of thousands more manufacturing workers. We are committed to not only building upon existing outcomes that are so vital to manufacturing’s success in America, but also to doing what we can to make them even better.” House Ways and Means Committee Chairman Kevin Brady (R-TX) gave a keynote at the event, at which NAM members BNSF Railway Company and Gowan also spoke. We were pleased that our colleagues at the Texas Association of Business helped coordinate this event. Look for future events in the coming weeks. For more information or to let us know if your company would like to participate in future public events, please contact NAM Vice President of International Economic Affairs Linda Dempsey. The Commerce Department is partnering with the University of Southern California Marshall Center for Global Supply Chain Management to host an exhibition and technology challenge. The event—phase one of a larger partnership effort to improve 21st-century U.S. supply chain excellence—will bring together supply chain stakeholders, members of port communities, system providers and leading researchers in this field as well as talented teams of technology innovators competing for a $15,000 prize for the supply chain information-sharing technologies. For more information, click here. The USTDA will host a Global Coal-Fired Power Emissions Monitoring and Control RTM to bring public officials and coal plant operators from Turkey, South Africa and Romania to the United States for site visits and meetings with U.S. businesses. Turkey, South Africa and Romania use a significant amount of coal-fired power and are making plans to retrofit older coal-fired power plants as well as incorporate emissions-control technologies into new ones. As they pursue these goals, delegates will attend meetings with U.S. suppliers of SOx, NOx, VOC, mercury and particulate matter controls and will meet with industry associations and government agencies. The itinerary involves visits to U.S. coal-fired power plants using these technologies. For more information on how your company or organization can participate, contact David Sellers at david.sellers@erg.com or (434) 979-0218. Join the U.S. Commercial Service and the Mid-America District Export Council for Discover Global Markets: Design + Construct, a dynamic conference bringing together global leaders in the design and construction sectors. The conference will feature presentations on global construction opportunities, prescreened matchmaking and networking sessions to build new business and partnerships. Attendees will include international executives, sales and marketing professionals, project owners, developers, architects, engineers and construction firms. For more information, click here. The U.S. Commercial Service will host a conference to focus on regional-specific sessions, market-entry strategies, legal, logistics and trade financing resources as well as prearranged one-on-one consultations with U.S. and Foreign Commercial Service commercial officers and/or Department of State economic/commercial officers with expertise in commercial markets throughout the Caribbean region. For more information, contact Delia Valdivia at delia.valdivia@trade.gov or click here. Application deadline is March 16. The USTDA will host a Global Coal-Fired Power Emissions Monitoring and Control RTM to bring public officials and coal plant operators from India, Indonesia, Thailand and Vietnam to the United States for meetings with U.S. businesses. As Asian countries are expected to account for the largest growth in coal demand through 2021, these countries are exploring their options for improving air quality while balancing growing energy demands. Through this visit, delegates will participate in meetings with U.S. suppliers of SOx, NOx, VOC, mercury and particulate matter controls and will meet with industry associations and government agencies. The delegation will also attend site visits to U.S. coal-fired power plants using these technologies. For more information about how your company or organization can participate, contact David Sellers at david.sellers@erg.com or (434) 979-0218. For a listing of upcoming USTDA missions, click here. For a listing of upcoming Commerce Department trade missions, click here.. Contact Chief Economist Chad Moutray at cmoutray@nam.org.